Giant Peacock Moth, 1889. Chalk with pen and brush and ink on paper, 16.3 x 24.2 cm. Van Gogh Museum, Amsterdam (Vincent van Gogh Foundation). 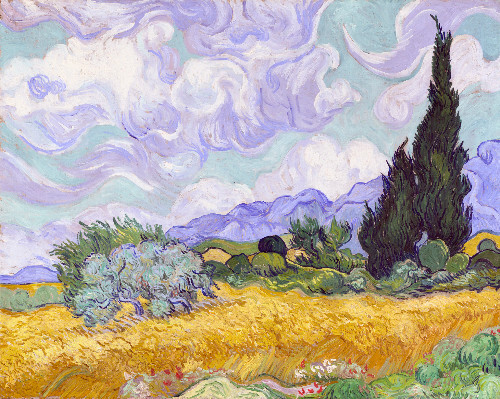 A Wheatfield, with Cypresses, 1889. Oil on canvas, 72.1 x 90.9 cm. The National Gallery, London, bought Courtauld Fund, 1923 Image © The National Gallery, London 2014. 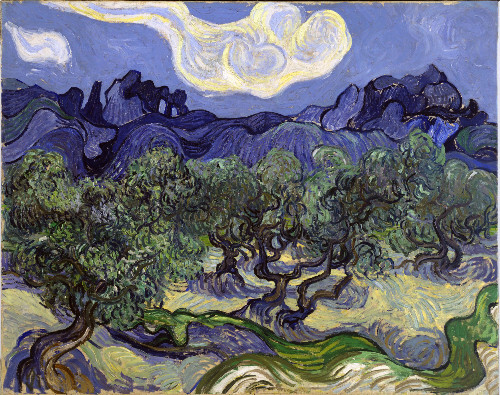 The Olive Trees, Saint-Rémy, June–July 1889. Oil on canvas, 72.6 x 91.4 cm. The Museum of Modern Art, New York, Mrs. John Hay Whitney Bequest, 1998 Image © The Museum of Modern Art/Licensed by SCALA / Art Resource, NY. 236 pages, illustrated with notes, checklist and index, 2015. The parking lots of the Clark Art Institute have been packed all summer, including mid week and early in the day. Even after extensive renovation and expansion, one summer after the reopening of Tadao Ando’s grand design, there is simply not enough space for cars. They line the road at the edge of the campus. Credit that to the appeal of Van Gogh and Nature an exhibition focused on many less known and rarely encountered works by the Dutch Post Impressionist. Adding to the number of visitors is a summer long visit from Paris of the iconic work Whistler’s Mother. This tandem of blockbusters in the Berkshires is a parting coup of long time Clark director Michael Conforti. He was recently given a rousing sendoff that entailed capacity attendance and ceremonies. Not to suggest disappointment but for most visitors the exhibition will not be what they expected. There are few of the great and familiar works in this different and more intimate view of the work of the artist. During ten years as an artist he created some 2,000 works including 900 paintings and 1,100 works on paper. The exhibition presents fifty paintings and drawings by Vincent van Gogh (30 March 1853 – 29 July 1890) including iconic paintings such as A Wheatfield, with Cypresses (1889, National Gallery, London), The Olive Trees (1889, The Museum of Modern Art, New York), and The Sower (1888, Kröller-Müller Museum, Otterlo). 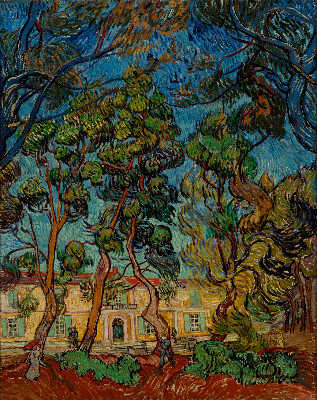 Works included in the exhibition are on loan from many of the most noted collections of the artist’s works, including the Van Gogh Museum, Amsterdam; the Kröller-Müller Museum, Otterlo; the Museé d’Orsay, Paris; the National Gallery, London; The Metropolitan Museum, New York; and the Museum of Modern Art, New York. The curators draw extensively from Van Gogh’s letters and from research into the artist’s deep interest in literature and science to explore the influences and themes that dominate much of his work. From his earliest letters to his last great drawings and paintings, Van Gogh showed an extraordinary fascination with the natural world. Youthful studies of trees, flowers, and heath-land were accompanied by verbal descriptions of the changing seasons, while increasingly ambitious pictures showed many aspects of the Dutch landscape. What we encounter is the legacy of an artist who packed his paints and went out into nature as often as weather and season would allow. On inclement days he remained in the studio working on still life paintings and portraits of friends like the Postman Roulin his wife and family, neighbors, or Dr. Gachet the therapist who treated him. This absorbing view of the work allows us to see the ebb and flow of an artist who was inspired, indeed compelled, to paint every day. Given his enormous production one soon realizes that the quality and impact of the paintings varies greatly. There is however, a disclaimer, that every work no matter how minor was created by one of the most compelling artists of all time. That notion encourages us to linger over the works probing just what the artist had in mind with each and every painting. While the artist in his mature phase worked quickly and intuitively with thick paint in a sculpted process of relief strokes what was the intentionality? In what ways are the works in this limited overview both similar as well as unique? When an artist works with such intensity in a series of creations connected thematically it is possible to track a trajectory. How do we come to identify and absorb a thread through the exhibition? Just what have we learned about him that enforces or contradicts the received ideas? Our perception of the artist is largely based on a selection of iconic works which we remember vividly but are not in this exhibition. From the early dark period there is Birds’ Nests (late September-early October, 1855). What appear to be three or four nests were collected and set up in the studio. The largest nest suggests several eggs. There isn’t a hint of color but a strong sense of the texture of the materials. It is the kind of small work that perhaps most visitors will pass by. The artist was still studying his materials and process. This small painting provides information about that. Before exploring painting he had already mastered drawing. We see his forceful, direct, graphic development in the pencil, pen and ink with watercolor depiction of Pollard Birches, 1884. 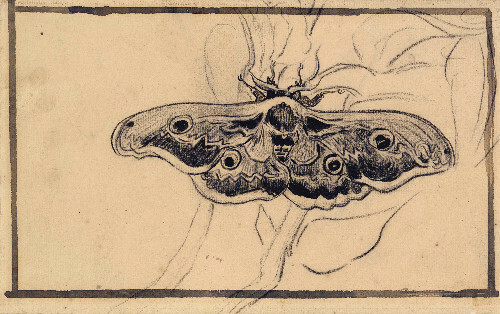 The stark and compelling graphic study of a Giant Peacock Moth, 1889, related to the unique and riveting painting of the same subject. The painting, which is different from much of what we intuit about the artist, has been used as the illustration on the cover of the catalogue. That suggests its curatorial primacy. It is an indicator that the artist explored all aspects of nature including entomology. From when the artist resided in Paris we have views of the city. A small but important cityscape is Terrace in the Luxemburg Gardens, 1886, which is owned by the Clark. Unlike the impressionists who influenced him the artist did not depict grand views of the city. His paintings of the poorer section of Montmartre include wind mills which may have evoked his native Holland. While not among his greatest works bright colors and a mottled impressionist background of accented blue in Imperial Crown Fritillaries in a Copper Vase, 1887 is appealing. A similar if not the exact copper vase is displayed next to the painting. The painting indicates that he purchased exotic flowers and not just ones that he could find during nature walks. Some of his most famous still life paintings, not in this exhibition, focused on sun flowers and irises. He also depicted inanimate subjects such as his bedroom with its simple furniture, a chair with candle, and even his well worn shoes. What is interesting about a small work like Undergrowth, 1887, is the manner in which it suggests the artist sketching in the woods. With brilliant, rapid economy he has conveyed the essence of what he sees. Such studies were notations for the artist rather than finished works to be sent to his brother’s gallery in Paris. It conveys the idea of privacy, what the artist creates for his own education, compared to more ambitious finished works to be exhibited. Much of the work in the exhibition underscores that he was a student of nature. He was constantly observing what most would consider quite ordinary views. Consider the study of nature and art of the British philosopher Edmund Burke (1729-1797) Philosophical Enquiry into the Origin of our Ideas of the Sublime and the Beautiful. William Gilpin popularized Burke with the widely read Essays on Picturesque Beauty, Picturesque Travel, and Sketching Landscape. Nature and the sublime are an important aspect of 19th century romanticism. 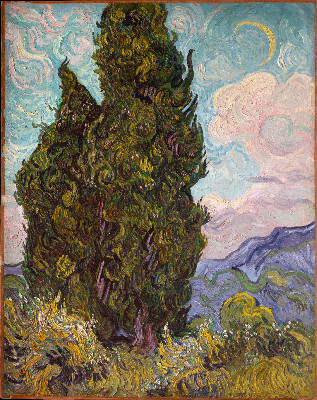 Van Gogh was studying nature some 30 years after the death of the British artist J.M.W. Turner (1775-1851) whose primary interest was in the sublime. The approach of van Gogh was more in sync with the ruralism of the Barbizon artists or the realism of Gustave Courbet. That evolved to the palette and technique of impressionist landscape painters. He was known to make copies of compositions and subjects by the Barbizon artist Jean Francois Millet. His early masterpiece The Potato Eaters is an example of that influence. 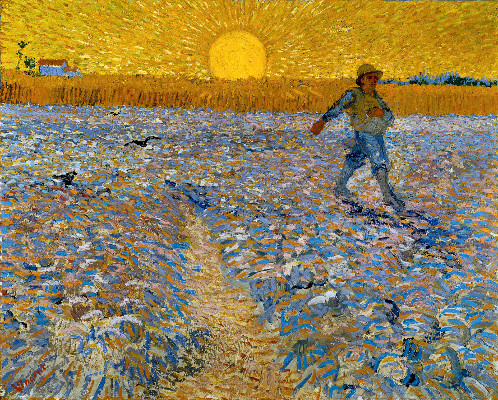 It is interesting to compare The Sower, 1888, with crude, emotionally charged brush strokes to another approach to that theme, the more famous painting Sower with Setting Sun , 1888. The latter work is not on view but is illustrated in the catalogue. The composition reveals what the artist learned through the study of Japanese prints. As the work evolved to a frenzy of color and undulating patterns of brush strokes there is a transition from observing nature to being consumed by it. It suggests animism which is common to children, indigenous people and the mentally disturbed. In this state of mind nature is charged and even threatening. Ancient peoples, including the Egyptians and Greeks, regarded nature as gods and goddesses. This persists in our notion of mother earth and sister moon. Ravine, 1889, from the Museum of Fine Arts, Boston has always struck me as a bleak and disturbing image. It represents a menacing, disquieting view of landscape. Just what was the artist’s state of mind when he created that painting? Knowing that the artist was under the care of Dr. Gachet, his life ended by suicide, there is a tendency to look at the work as fodder for psychological sleuthing. This exhibition asks us to understand that van Gogh was uniquely gifted as an artist. However emotionally charged the work should be appreciated on its own terms. A work that begs the question is Hospital at Saint-Remy, 1889. It is a highly energized view of the building in which he resided, some people are walking about and there are animated trees against an undulating sky. The relationship between patient and painting could not be more direct. 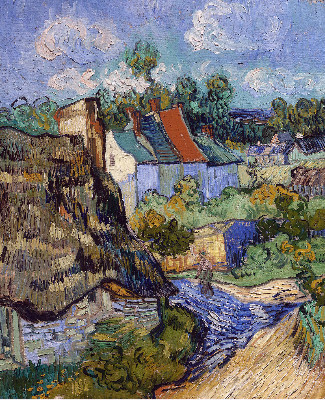 In the selection of works House at Auvers, 1890, which I literally grew up with at the MFA, holds it own. It is an outstanding painting from the late period depicting small houses in the village. The clouds of the sky are rendered with the same sculptural impasto that we see in the busy texture of the thatch roof in the foreground. The most unique and surprising painting in this exhibition is Rain-Auvers, 1890. We wonder how he managed this. Was it something that occurred while in nature and then finished in the studio? We can’t imagine the artist painting in the rain. The catalogue illustrates it on a page opposite a reproduction of Sudden Shower on the Great Bridge near Atake, 1857, by Utagawa Hiroshige. The juxtaposition conveys what he had learned from Japanese prints. Was the painting inspired by nature or a work conflating observation and imagination? The success and impact of this exhibition offers many possibilities to think about and reconsider an artist whom most of us feel we know like a Dutch uncle. "Like the show it examines, this review presents a plausible and concise narrative of the great artist's interests and development. It and the Clark show share virtues of depth and economy. I found it helpful." "for me as well seeing a couple of paintings from the boston, m f a collection was like visiting old friends. I think I mentioned to you that paintings often touch us in different ways based on what we are into at the time. because I have been into abstract painting pushing acrylics around, for the first time I looked at van Gogh's technique more than I had when I was a young painter. while oils were his medium, I was taken by the way he manipulated the paint for a highly charged expression. nice that you wrote about his studies of moths, etc. he had a very active, searching mind."